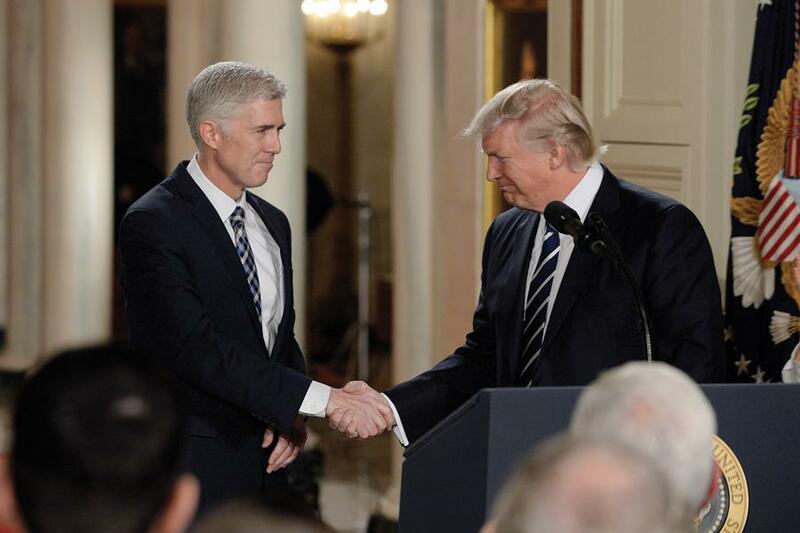 President Donald Trump on Jan. 31 announces Supreme Court nominee Neil Gorsuch in the East Room of the White House. Illinois Democrats in January introduced a bill to protect access to abortion clinics in response to last year’s election. Illinois Democrats are trying to send a message to President Donald Trump through a state bill aimed at protecting access to abortion clinics. The bill, introduced to the Illinois House in January by state Rep. Sara Feigenholtz (D-Chicago) and co-sponsored by Rep. Robyn Gabel (D-Evanston), would repeal a “trigger provision” in state law stipulating that abortion would be banned if the Supreme Court overturns or modifies Roe v. Wade. It would also allow women with Medicaid and state employee health insurance to use their coverage for abortions for the first time. “This legislation serves as a clear message that no matter what Donald Trump does, Illinois women will have access to safe and legal abortion,” Feigenholtz wrote in a Facebook post. On Wednesday, the legislation passed through the state’s Human Services Committee despite concerns from some Republicans about deleting a section from the bill saying an unborn child is a human being from the time of conception. Still, the bill has a long way to go before becoming law. The proposal needs approval from both the House and Senate, plus a signature from Gov. Bruce Rauner — who in July drew ire from Republicans after signing two laws that expanded birth control coverage and access to abortions. Lorie Chaiten, director of the Reproductive Rights Project at the American Civil Liberties Union of Illinois, said she was optimistic the bill would become law, but that her organization intended to “take no risk” in getting it passed. Ahead of Wednesday’s vote, the ACLU asked people to sign witness slips in favor of the bill. More than 7,800 proponents signed slips, which was twice the number of those in opposition, according the ACLU of Illinois Facebook page. “We want to make absolutely clear that women will be able to access safe, quality abortion care in our state regardless of what happens in Washington,” Chaiten said. Chaiten said after Trump’s victory in the presidential election, there is “urgency” to reassert the right to abortion. During his campaign, Trump promised to appoint anti-abortion Supreme Court justices who would overturn the landmark decision that gives women the right to an abortion. Last week, Trump named Neil Gorsuch his nominee for the Supreme Court — a judge on the 10th U.S. Circuit Court of Appeals whose position on abortion remains unclear. While Gorsuch attends an Episcopal church, he has never been outspoken on social issues or ruled directly on abortion rights. Eric Scheidler, executive director of the Chicago-based Pro-Life Action League, said the Illinois proposal served little purpose since Roe v. Wade is not at risk of being overturned. He added that taxpayers should not be forced to pay for abortion through public aid. He said if the bill passes, there could be more abortions as a result of increased funding. But Chaitin said the bill only served to remove a “discriminatory” restriction on women’s health care. She said the change was not without precedent because 15 other states cover abortion under Medicaid. “Regardless of what we think about abortion, we can all agree that when a woman has decided to end her pregnancy she should be able to … do so from a quality health care provider,” Chaitin said. The bill goes next to the House for a vote.